Got anxiety looming at the pit of your stomach, rising up to your chest and gripping you with discomfort and stress? Do you feel the heat making your cheeks go uncomfortably red? Do night sweats or cramping or irregular menses give you sleepless nights with nausea, with depression, embarrassing loo trips, arresting abdomen pains, unexplainable bouts of anger, irritation, irrationality and sadness, those headaches and that loss of intimacy featuring in your everyday life? What do 7 ‘Dhatu’s or ‘Tissue Systems’ have to do with any of these?! Why, the 7 Dhatus and the 3 Ayurvedic Pillars have EVERYTHING to do with all these symptoms that may have now become your most loyal companions, refusing to part from you even after all those hormone injections, those set-me-right pills of hope, leaving you still as far away from relief as the south pole! But where is the true explanation of what is really going on? Why does it happen? How does this mechanism work, and if these changes are inevitable, what is the best way to deal with them? We often say that men don’t understand how women feel, but the truth is, even a lot of women don’t understand. Why? Because they often don’t know! With her complex biological system, a woman undergoes many complex changes through her life, which can be tough to deal with. And though it’s sad how symptoms of suffering have become an unquestioned, accepted reality of our life today, the good news is, it doesn’t have to be so, it was never meant to be! Specially, since all these symptoms have a lot to do with you being you as a woman. What does that mean? !you being you as a woman?! the very quality of not just your life but also the life of your other young friends, daughters and sisters today. the menace of the menses and of course, menopause! that stops you from functioning is a disease. Symptoms like acidity, sour belching, sweating, inflammation and excess heat in the tissues causing the destruction of the egg and sperm are Pitta imbalances. Sluggish Digestion, feeling too full, meals taking a long time to digest, elimination taking long, swelling, weight gain, a hard time motivating yourself and blockages in the reproductive channel are Kapha imbalances. But then, how do Doshas cause disease? And how does it influence your reproductive health? What can you do to prevent both general and reproductive health imbalances? And this is where ‘You’ being ‘you’ as a woman comes into play. You need to understand your doshas, the real meaning of ‘doshas’, you need to understand the difference between you and your Doshic tendencies, know what NOT to do. or Tissue Systems in the body. physical tissues of the body. reproductive life for both men as well as women. But how do the Dhatus affect your body and how can you take care of them? How does ‘Medha Dhatu’ influence estrogen levels? What are the 5 signs of your reproductive cycle that show you’re healthy? What is the role of ‘Ama’ or toxins in influencing your menstrual or menopausal health? 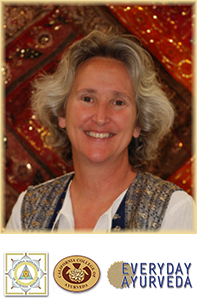 A founding member and former Secretary of the California Association of Ayurvedic Medicine, Mary Thompson , C.A.S., P.K.S., graduated from the first graduating class of the California College of Ayurveda in 1997 and now is a senior teacher there. In 2008 she received the Charaka Award for Excellence in Ayurvedic Teaching and was given the title "Ayurvedacharya" (respected teacher of Ayurveda). She is also a founder of the non-profit organization. Mary has been teaching at the California College of Ayurveda for 18 years and considers herself to be a perpetual student of Ayurveda. Her main focus at the school right now is in teaching the clinical application of Ayurvedic principles to treat disease conditions. In this, she appreciates the wisdom of the ancient texts and the application of traditional treatments as well as the modern interpretation of disease pathology and designing treatment protocols for those conditions. Mary also enjoys mentoring practitioners who are starting out in their practice or wanting to discuss a particular client. Before finding Ayurveda, Mary was an elementary school teacher and a child-care director. As a child-care director for school aged children, she was concerned about the rate of diagnosis of ADD/ADHD among this population. One program that she worked with, had about 10% of the children on medication for ADD/ADHD. She thought that medicating this age group was a frightening trend. When she looked at their lives and into their lunchboxes, she thought that there had to be a solution in diet and lifestyle, but didn’t know exactly what that solution was. And this is what initially spurred her into the study of Ayurveda with an intention of working with this population. Mary saw this condition as being a family condition, everyone in the family was stressed and trying to manage their stresses with the typically American diet. She felt that Ayurveda would give her a greater insight into the cause of this imbalance and a template for its treatment. However, it was something else, quite touching that got Mary into formal study of Ayurveda. "When I was 34 years old, I was diagnosed with uterine fibroids. These are typically benign tumors, but because of their location and form, it was not possible to determine that they were non-cancerous from ultrasound alone. I was advised to have “exploratory” surgery so the doctors could get a closer look at them. I was raised mainstream in the US, my mother was a nurse, and I thought doctors knew everything, so I willingly signed up for the surgery. I asked that if the tumors were indeed non-cancerous that they leave the uterus in place. This was against the advice of the doctors and I had to sign several documents to this effect. I had no children at the time and was told the fibroids had probably interfered with my childbearing potential. They told me that it was unlikely that I would have children because I was already so old. They pointed out that if I wasn’t going to have children that I didn’t need a uterus. Still, I asked that they leave it in. After the surgery was complete I woke in the most intense pain of my life. They had cut through the abdominal muscles to access the tumors and I had both external and internal stitches. It would take me six weeks or more to be able to work, drive or even vacuum. I was relieved to hear that the fibroids were benign tumors, no cancer. In the next breath, I was told that they had left two fibroids in place. They said this was because removing them would have jeopardized the health of the uterus. They again told me that I should have simply had them remove the uterus. They predicted that I would have to come back “in a year or two” and have this surgery again and that time, they would take it out. I was distraught. I wasn’t yet out of the recovery room and they were already booking my return. When I had recovered more fully I asked my primary doctor more questions about this. Why did these occur? What could I do to eradicate them so that I wouldn’t need further surgery? What could I do to improve the health of my reproductive tract so that childbearing was possible? Each question was met with a shrug. He didn’t know why they had occurred. For my age and the type of fibroids, it was anomalous. It was just one of those things that happens. For ridding myself of the ones left behind, he held out no hope. He said they would continue to grow and that I would need another surgery, though he couldn’t say when. As to improving the health of my reproductive system, he looked at me with compassion when he told me that I was just too old to consider this very likely. I was dumbstruck. My entire belief system in the infallibility of doctors was shattered. He didn’t know. Medication and surgery were the only tools in his toolkit. I had to find another way. I was committed to avoiding another surgery and getting as healthy as possible. This commitment led me to Western Herbalism and natural health care practices. One day, in an herb class, the teacher mentioned the word “Ayurveda”. I interrupted her. What was that word? I’d never heard of this. I had her spell the word and give me a few book titles for further study. I don’t remember anything else she said that day, I knew I had to learn more about this. I left class and drove to the bookstore. I bought five books on Ayurveda and began to pore over them. I learned about the elements, the doshas and the causes of imbalance. I looked at my diet and my lifestyle and I knew that I had created my condition and that I had the power in my hands to correct it. That began my informal study of Ayurveda for my own health. Eventually by commitment to Ayurvedic self-care including huge changes in my diet and lifestyle, I recovered the health of my reproductive system. After being told at 34 that conception was unlikely, I gave birth to my son when I was 43. He was born at home in a natural, drug-free birth with my family and friends around." 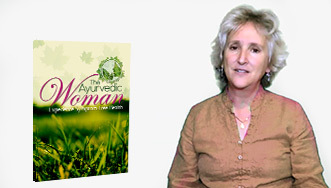 The Ayurvedic Woman is a program that explains the Ayurvedic Perspective of Women’s Health and opens up ways to not just reduce or eliminate disturbances in your reproductive system, but also make you a more efficient, more joyful, more optimistic healthy individual who can responsibly lead the baton of good health for your family, friends as well as community. 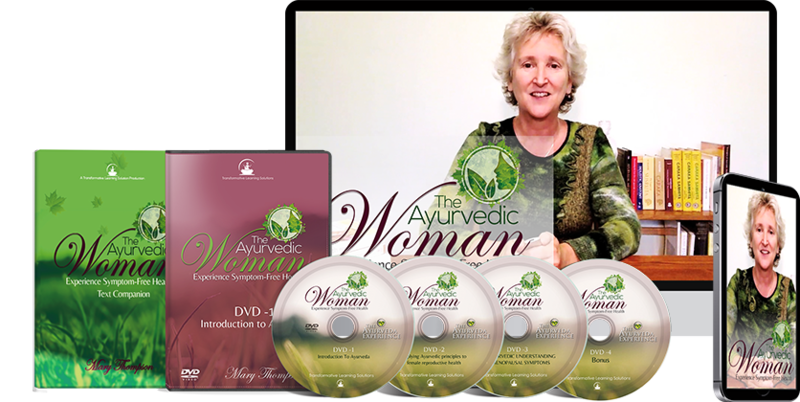 Why is it important to learn about the Ayurvedic Path to Women’s Health? Through Ayurvedic education you learn the language of the body. You can interpret your regularity of menses and the quality of menstrual flow to understand the impact of the doshas in the body. Without this education, you may think that an imbalance is normal or seek treatment that will relieve the symptom but not eradicate the cause. For menopause, by learning the effect of the hormones, you can apply practices to support balance when the hormones are not being produced and use natural treatments to alleviate symptoms you may experience prior to or during menopause so that you can have that control over your mental and physical health. This course is designed to give practical dietary and lifestyle recommendations that women can apply in their lives today to create better health now and in the future. You get 5 very valuable bonuses as gifts! 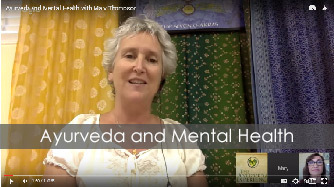 will be access to the webinar session with Mary Thompson on Ayurveda and Mental Health. This session will help you understand how you can handle your moods and emotions and maintain an internal state of happiness by taking control of your life Ayurvedically. will be a demonstrative video of a Special Breast Massage Ritual by Melanie Sachs where you can learn how to take better care of yourself through massage- focussing on Breast Massage and the uses of Shatavari for feminine health concerns. 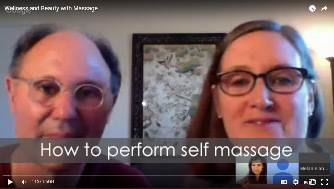 will be another demonstrative video with Robert and Melanie Sachs describing how to perform self massage including Abhyanga with demos of face massage, foot massage and abdomen massage. Program and get Instant Access Now. Get the entire Program shipped free to you anywhere in the world. The entire Program shipped free PLUS Instant Access Digital Program. Mary is not just a teacher with 19 years of experience but it’s really the quality of her teaching that’s the most important. Mary is well known for being concise, clear and inspirational. 1First and foremost, this education should begin right at the age of transition of a girl to a woman- it is THAT important and fundamental. However, in today’s stressful times, it is all the more important for women of all age groups at any stage of life to learn this about their own bodies, to understand and love themselves better. 2When we’re young, hail and hearty on relationships issues, maintaining a slim waistline, saving enough for that dream holiday or competing with people at work and at that age, we have no conversations about what is going to happen to you in a few years, nobody talks about the reality that might take a dark shape for you if you do not act ‘now’. As a woman, education for a deeper understanding of the menstrual cycle and the inevitable menopause, is very important. 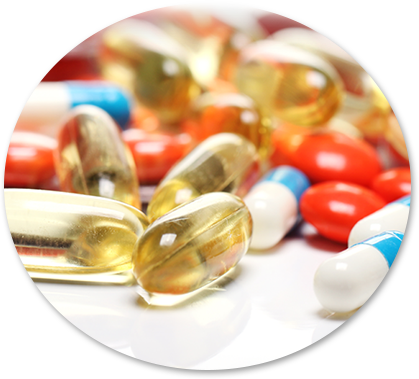 5You must take responsibility for yourself, especially when Ayurveda makes it so easy for you- external elements sucha as pills can only do as much, sometimes not even that. can only do as much, sometimes not even that. An educated approach will give you greater control to prevent and manage symptoms. 6Even for men, they must know and understand how doshas affect reproductive cycles as well as how they affect women in particular as this would help deepening relationships and make it easier for you and partner to sail through tough times. This course has been made by experienced experts. Highly talented directors have ensured the best quality for them. But if you still don’t love our courses, we can give you a prompt and courteous refund within 60 days after starting your program. It will tell you the Art of Living in this world: a scientific process to master your emotions, mind and the body. This course will equip you with eight powers to master your life. What Makes This Program Different And What Will It Do For You? The only program of its kind, it makes access to a highly qualified, experienced and respected teacher of Ayurveda not only easy, but also affordable. 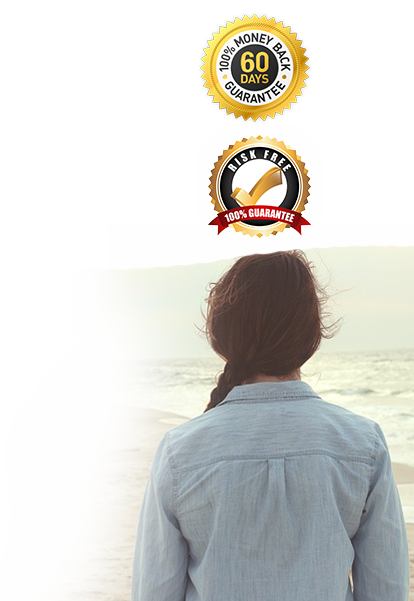 With its 100% satisfaction, 60 days money back guarantee, it makes it really easy, comfortable and risk-free for you to begin learning. Breaks down many myths about the concept of the ‘Dosha’s, explains their true meaning and correct use and tells you, what NOT to do. In the later years, it would enable a comfortable, confidence boosting transition into the next phase of your life- of sexual freedom and new, wholesome self-discovery with grace and ease. “I’ve known Mary Thompson for several years, she was one of my primary instructors when I was a student at the California College of Ayurveda and I’ve continued to study with Mary beyond graduation whenever she gives webinars or classes. I’ve even asked Mary to supervise me with a couple of my clients. Mary has a great ability to be able to share her perspective and the Ayurvedic practices and bring it down to what everyday people can really understand. WHY IS TIMELY ACTION THE KEY? A state of true health and an inspirational life isn’t an ‘overnight miracle’- it is an ‘everynight transition’ with small steps every single day which compound to give you strong and resilient health. The earlier you start the better, indeed, but the key is that you start, that you put in an effort in the first place! As we go on committing ‘Crimes against wisdom’ (the introduction section of the program talks in detail about what crimes against wisdom are, which crimes are you committing and how they affect you) we lose time and with that, a precious part of our lives. these are things that becoming an Ayurvedic Woman today will bring to you, and these are simply invaluable! Life does not pause or wait for you to finish your tasks that keep you busy. It moves on, your cells change every few months, years pass and your body continues to transition. And even as you read this page, all of this goes on. Then why should you wait to listen to the needs of your body, delay taking control of your health and enjoy a blissful and radiant life? What motivated you to do this course? "I want to educate and empower women to take charge of their reproductive health. 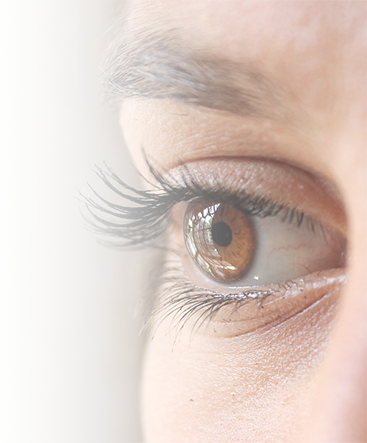 Every month women have the opportunity to assess how they are managing the tissues of the body and to get a glimpse into the impact of stress on their bodies. Through education we learn the language of the body. We can interpret our regularity of menses and the quality of menstrual flow to understand the impact of the doshas in the body. Without this education, we may think that an imbalance is normal or seek treatment that will relieve the symptom but not eradicate the cause. I believe that we have the power in our hands to eliminate the causes of reproductive challenges and I want to share that knowledge to give women that power to improve their overall health and their lives. In looking at menopause, I want to advocate for women to consider self-care prior to menopause. By learning the effect of the hormones, we can apply practices to support balance when the hormones are not being produced. I want to educate and advocate for women to use natural treatments to alleviate symptoms they may experience prior to or during menopause so that they can have that control over their mental and physical health. Life can be very long after menopause, and it is best if those can be free of symptoms driven by menopause. I firmly believe that our health is in our hands. 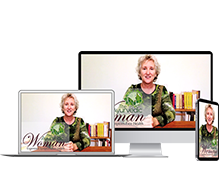 This course is designed to give practical dietary and lifestyle recommendations that women can apply in their lives today to create better health now and in the future. Having seen the effects of Ayurvedic principles in myself, in regulation of the menstrual cycle, elimination of symptoms of PMS and menstrual discomfort, having dealt with recovery of the health of the reproductive system after dire warnings from doctors and having gone through menopause smoothly, I feel qualified and obligated to share these principles with as many women as possible." We are available and happy to assist you anytime, anywhere. You can take your courses wherever you go, whenever you want. We make it easier for you because we understand there’s never always enough time in today’s busy life. Once you awaken, you realize there’s a higher purpose. But to be able to do so, you should start somewhere. Our programs are the best way towards a higher self since they have the most valuable ancient stories applied to modern life: learnings that people seek for years and are usually not able to find. Every course is made by referents in the topics, with considerable years of experience. Covered by major publishers, media houses and channels like ABC, Hallmark, NBC & HGTV etc. radiant version of myself today and tomorrow! I owe the vast majority of my knowledge to mary. She is the favourite amongst all the students of my class. She has extensive knowledge and experience in Ayurveda but that alone doesn’t make her a great teacher. What I appreciate about Mary is that she can deliver that knowledge and experience she has in multiple ways so that each students specific learning style is met. You’ll never hear her say go look something up in the text and if she doesn’t know the answer to something which is admittedly rare, she will always get back to you cause even though she became a teacher her desire for learning never stopped. I want to be a teacher myself one day and I hope that I can teach even at half the level that she does cause if I do my students will be in really good shape. If you’re lucky enough to have Mary as a teacher, then you’ll have an edge over everyone else-that’s just how powerful a teacher she is. She has the unique ability to take complex subjects like Ayurveda and be able to explain in such simple terms that it was readily accessible to anyone regardless of their background. I first met Mary Thompson about 16 years ago, she was an instructor at the California College of Ayurveda and she taught the first year program and I can pretty accurately speak for everyone in the class, we all really looked forward to whenever she taught She has the unique ability to take complex subjects like Ayurveda and be able to explain in such simple terms that it was readily accessible to anyone regardless of their background. And few people have that rare ability to have a grasp of a subject matter as technical as Ayurveda and at the same time be able to explain it in such a way. I highly recommend her.